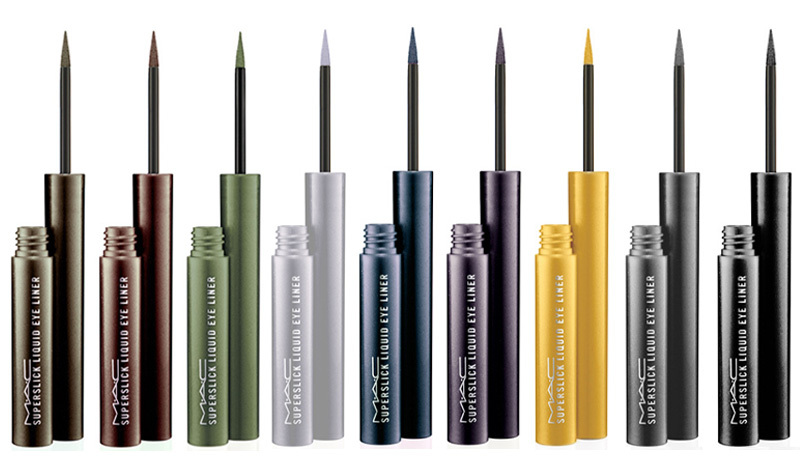 MAC recently launched their new product, the Superslick Liquid Eyeliners together with the Fabulous Felines Collection. Nine colours in total, range from classic black to bright silver. Here are six of them I picked up. Swatches taken indoor with flash. As you can see, just one swipe from the wand delivers intense colour which is very similar to the packaging itself. And this is one of the reasons I am liking this product. Consistency of the Superslick Liquid Eyeliners are a lot more watery and thinner than MAC’s Liquidlast Liners. Being more watery, it takes longer to dry. Remember to let them dry completely before opening your eyes, if not, they will crease. Once they have dried, they are super long-lasting, almost waterproof. It doesn’t crease or fade a bit throughout the day. I placed them under running water for about 5 mins, still looks good after I pat dry my arm. I usually use MAC’s Gently Off Eye & Lip Makeup Remover to remove my makeup. These liners rub off like rubber with bits and pieces everywhere but it’s a relatively easy job. For those who are curious about the application of these liners, don’t worry, they are very easy to apply. The soft, felt-tip applicator made application a breeze. Very easy to control and maneuver. I have done Look In Moan using Treat Me Nice and Look In Defiantly Feline featuring the Superslick Liquid Eyeliner. I like smoky heir, desires & devices. I am loving Smoky Heir too..
It’s such a pretty deep-plum colour..